This the fifth and last post on IMF's assessment of Irish economy released today. In previous posts, I covered IMF's assessment of Irish banks (here), Irish banks prospects with respect to the ECB stress tests (here), Irish households' balance sheets (here) and growth projections (here). This time around, lets take a look at IMF's past and present forecasts for growth. 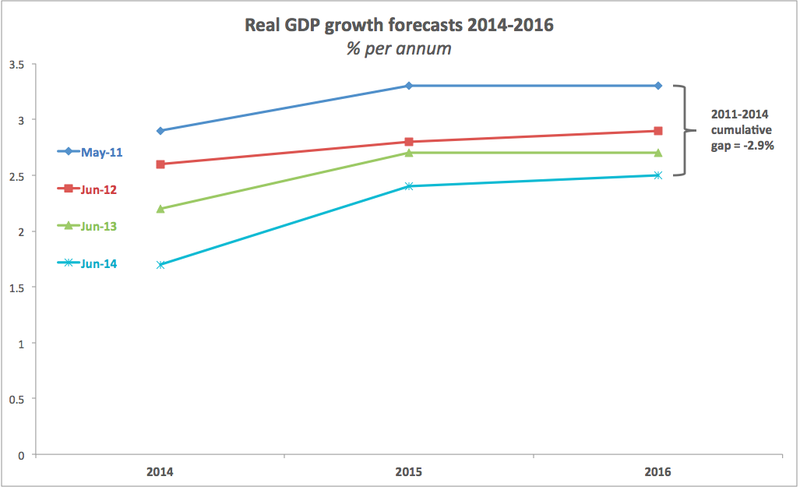 These are presented as charts, plotting evolution of growth forecasts from June 2011 through June 2014. First, IMF's GDP growth forecasts. You can see the deterioration of outlook year on year into 2014 for all three forecast years. IMF claims that things will finally improve in 2015 when GDP growth is forecast at 2.4%. 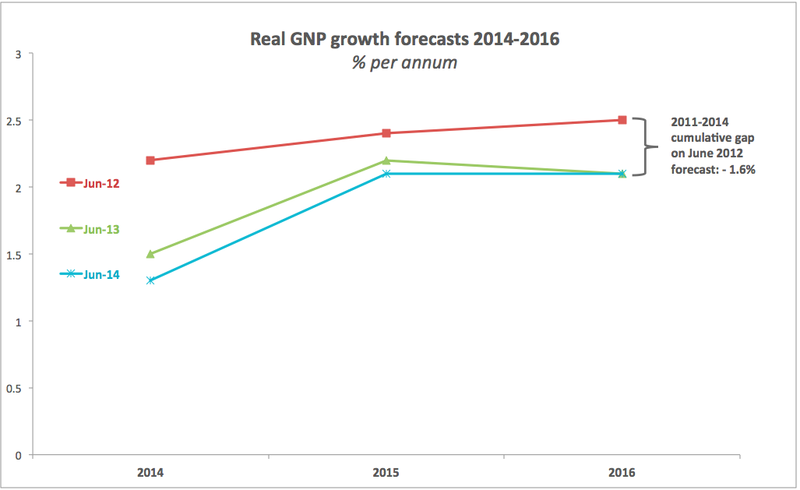 But last year, the Fund forecast 2014 growth (not 2015) at 2.2% and in 2012 the Fund expected 2014 growth to be 2.6% and so on. In simple terms, Fund's forecast published in June 2011 saw Irish real GDP growing by a cumulative 9.8% in 2014-2016. A year ago in June 2013 that same forecast fell to 7.8%, and today's forecast is down to 6.74%. Some material difference, disregarding the fact that GDP levels from which the above growth rate have been computed are already lower than assumed back in 2011 or 2013. The upgraded forecast for 2014 compared to the Fund predictions published a year ago is a welcome sign. But at 1.1% y/y growth this is hardly consistent with anything more than a stagnation. However, after 2014, the Fund is still projecting ver-lower rates of growth compared to its previous forecasts. 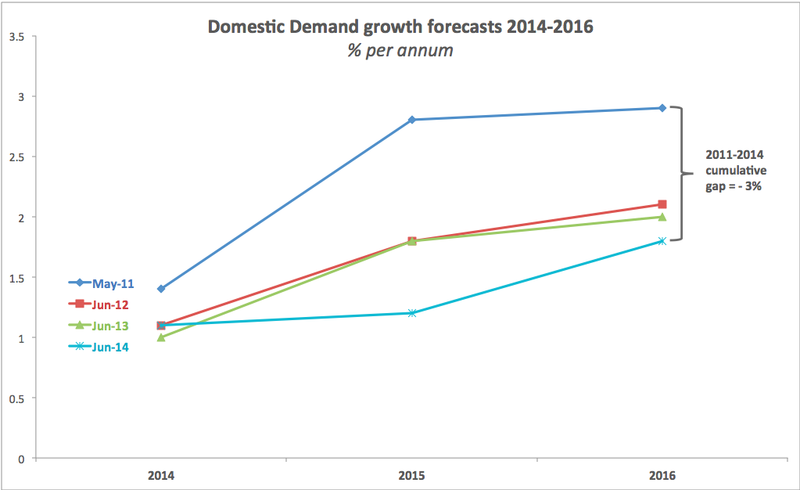 In June 2011, the Fund projected 2014-2016 cumulative growth in Domestic Demand to be 7.3%. In June 2013 that same projection was 4.9% and this time around it shrunk to 4.2%. Again, things are going South: in June 2013 the forecast for 2014 growth rate in exports was 3.5%. In June 2014 it is down to 2.5%. 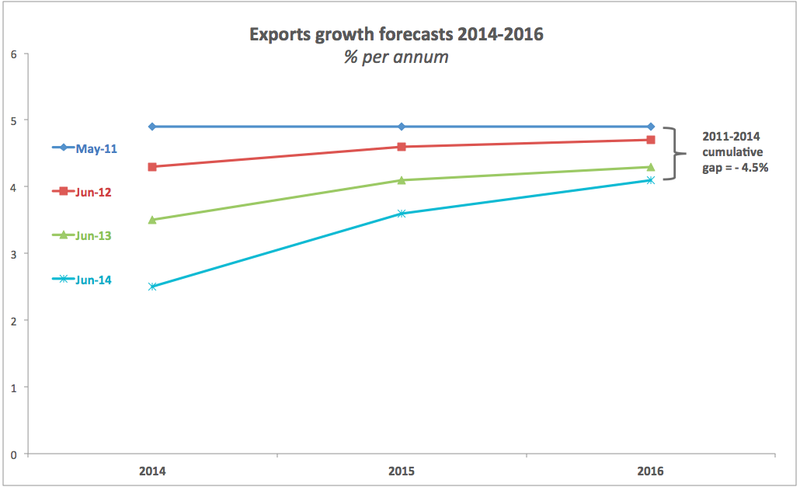 Back in June 2011, IMF predicted that over 2014-2016 Irish exports will rise 15.4%, this June the prediction is 10.5%. So in nominal terms, IMF was projecting 2014 GDP to be at EUR165.5bn back in June 2011, at EUR171bn in June 2012, at EUR173.4bn in June 2013 and the Fund's latest projection for 2014 nominal GDP is… EUR167.7bn. Now, note: growth rates in 2015-2016 discussed at the top of this post come on these levels, so we have lower growth off the lower base. Unimpressive as they are, GDP growth rates are even made worse by the continuous decrease in the base off which they are computed. And to top it all up, over 2014-2016, IMF expected Irish GDP to total EUR542.9 billion back in June 2013. 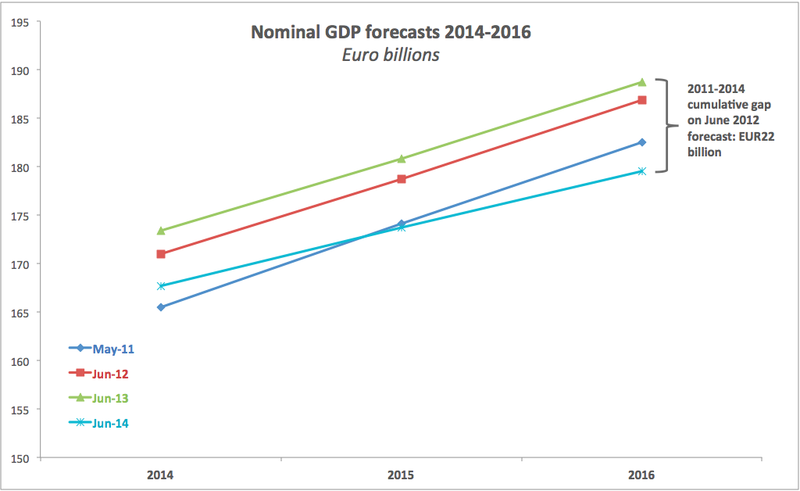 12 months later that forecast is down to EUR520.9 billion - down EUR22 billion over 3 years. Puts things into perspective, really, no? And you get the picture by now: things are getting worse and worse and worse in the minds of the Fund forecasters.